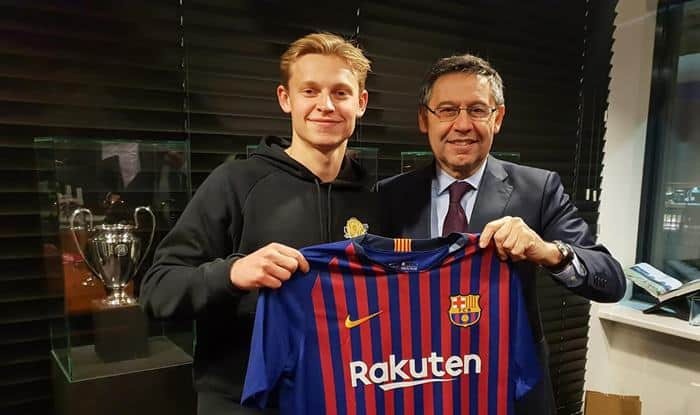 After roping in Kevin Prince Boateng, Barcelona have added another midfielder with the signing of 21-year-old Dutch midfielder Frenkie de Jong from Ajax for 75 million euros ($85.5 million). “De Jong is one of Europe’s most promising midfield talents,” Barcelona said in a statement. “At just 21 years of age, he is joining the club after proving himself as a multifunctional player with an excellent reading of the game and the ability to provide the killer pass,” the statement added. De Jong joined Ajax from Willem II in 2015. He played 65 matches for Ajax’s first team, scoring five goals. The Catalan club has left no stone unturned to solidify their squad depth in the ongoing January transfer window. The Lionel Messi-led team faced a difficult start but has been firing on all cylinders lately and is thriving on the top of the Spanish league table.